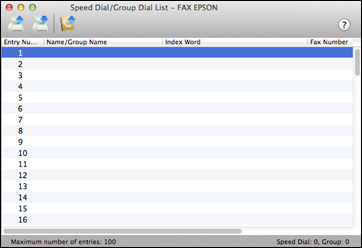 You can set up your speed dial and group dial lists using the FAX Utility. 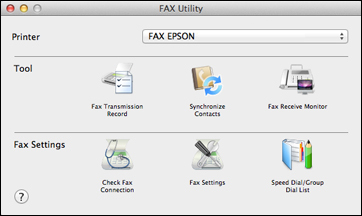 The utility also lets you import fax numbers from the MacAddress Book and back up fax numbers to your product's memory. Note: You can create up to 60 speed dial and group dial entries combined. OS X 10.6/10.7/10.8/10.9: In the Apple menu or the Dock, select System Preferences. Select Printers & Scanners, Print & Fax, or Print & Scan, select the FAX option for your product, and select Options & Supplies. Select Utility and select Open Printer Utility. OS X 10.5: In the Apple menu or the Dock, select System Preferences. Select Print & Fax, select the FAX option for your product, and select Open Print Queue. Select Utility. Select your FAX product in the Printer list. To add an entry, double-click an empty entry. Note: To edit an entry, select it and change the information. To delete an entry, select it and press the Delete key on your keyboard. To create a speed dial entry, select Speed Dial, enter a name and fax number, and click OK.
To create a group dial entry, select Group Dial, enter a name, select your desired fax numbers, and click OK.
Repeat the previous steps as necessary to add all your speed dial or group dial entries. To import entries from your MacAddress book, click the icon. When you are finished, click the icon to save the entries to your product's memory.